Optical activity (=the ability to rotate the plane of polarized light) is a direct result of chirality. Often times, the chirality is based on the existance of at least one chiral center, which has four different ligand attached to it. These four ligands can be oriented in two ways around the center, leading two different molecules that are called enantiomers. These two molecules are mirror images of each other. They are not superimposable. Enantiomers are identical in most tests like melting point, boiling point, solubility, infrared spectroscopy, NMR spectroscopy, etc. However, they behave differently when it comes to the rotation of plane-polarized light or when placed in a chiral environment. How can enantiomers be separated from each other? A common way of separation of enantiomers uses the conversion into diastereomers, that are not mirror images of each other. The following example demonstrates this principle. 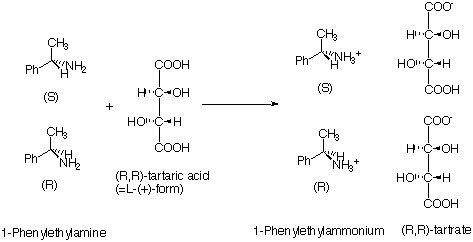 The two enantiomers 1-phenylethylamine (S-(-), R-(+)) are separated using (L)-(+)-tartaric acid (also known as the (R,R)-form) as resolving agent. The two salts formed possess different cation ions are therefore not enantiomers of each other anymore. The (S)-(1)-phenylethyl ammonium-(R,R)-tartrate salt crystallizes faster than the (R)-(1)-phenylethyl ammonium-(R,R)-tartrate salt. 1,1'-bi-2-naphthol can be resolved in various ways as well. The diagram below illustrates the strategy sown below (Kazlauskas, R.J., Org. Synth. 1998, Coll. Vol. 9, 77; 1992, 70, 60). Here, the diphenol is first converted into a diester. Then, cholesterol esterase is used to hydrolyse the (S)-enantiomer of the ester, which precipitates from solution. The (R)-enantiomer can be obtained after the workup of the mother liquors. A more recent method from Cai, D. et al. (Org. Synth. 2004, Coll. Vol. 10, 93; 1999, 76, 1) utilizes N-benzylcinchonidinium chloride as resolving reagent. How does this relate to the in-lab work? The first step is the resolution of the racemic 1,2-diaminocyclohexane. The commercially available product is a racemic mixture of the trans isomers. In order to perform an asymmetric synthesis, the starting material has to be optical pure (or close to it). 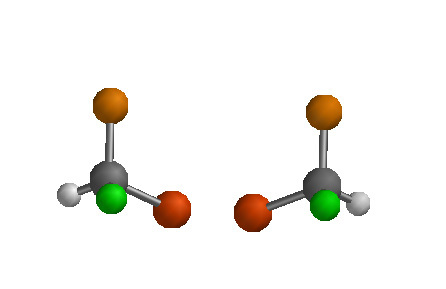 The resolution of the diastereomers is based on the different solubilities of the diastereomeric (R,R) tartrate salts that are obtained by reaction with (L)-(+)-tartaric acid. The (1R,2R)-amine-(2R,3R)-acid salt crystallizes from hot water, while the (1S, 2S)-amine-(2R,3R)-acid salt stays in solution. After recrystallization from water the obtained product is usually pure enough (>99 % according to literature) for the use in asymmetric synthesis. In order to prove the optical purity, the optical rotation can be determine using a polarimeter. In chem 30CL, currently GC on a chiral column is used to determine the optical purity (after releasing the free amine by reaction of the tartrate salt with sodium hydroxide). For more information see "A Short Survival Kit for O=Chem Lab"